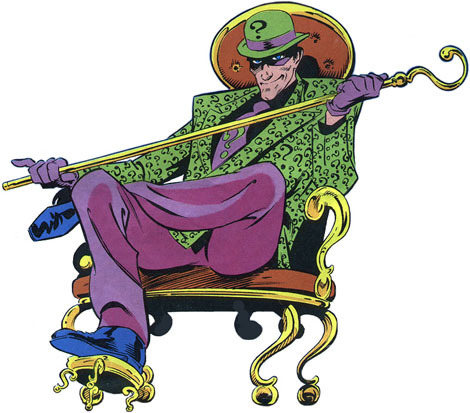 The Riddler has no super human abilities, but he is a criminal strategist of some cunning. He isn’t much of a hand-to-hand opponent so he often employs guns as he is an accomplished marksman. He sometimes employs weaponry disguised as puzzles, such as jigsaw pieces that explode, or pistols shaped like question marks. The Riddler usually employs a number of thugs to provide muscle for his schemes. When Eddie Nashton was a schoolboy, one of his teachers announced a contest to see which of her students could assemble a particular jigsaw puzzle the fastest. That night, Nashton secretly took a photograph of the assembled puzzle, which he found after breaking into the teachers desk. The next day, Eddie being the only student to know beforehand what the completed puzzle should look like, won the contest with ease. This was the first known example of Nashton’s dishonest use of puzzles and was most certainly a harbinger of things to come. Years later, the adult Nashton further parlayed his love of conundrums by running a rigged puzzle booth at a carnival. Yearning to make even bigger money, he decided to become a thief on a grand scale and chose to match wits with the Gotham City police and Batman. Changing his real name to Edward Nigma (E.Nigma), Nashton donned a costume festooned with question marks and became the Riddler, a wily crook that always sent the police clues to his forthcoming crimes in the forms of riddles and puzzles.